Recently, I found that I had a craving for a peach pie. What’s strange about this is that I’m fairly certain I’ve never had a peach pie before. Luckily for me, it’s peach season here in California. To my taste buds, the peaches here aren’t quite as sweet as those on the east coast; Angela merely dislikes the fact that they aren’t Georgia peaches. I bought some peaches at the farmer’s market, mainly on a whim. I had had the peach pie craving for awhile but had failed to look for any recipes before leaving so I had to guess as to how many to buy. I did manage to guess correctly although I’m not entirely certain I got free stone peaches. I had more trouble with slicing the first couple than I did with the rest but they still held onto their pits pretty well. This pie ended up being everything I was looking for in a peach pie. The peach flavor showed through. The peaches held their shape (one of my father’s complaints about peach pie is that the peaches get too soft; not these peaches). The first slice of pie was for dessert but most of the rest ended up being my breakfast (what? peaches are good for you). After writing this up, I want to make a peach pie again. Mix the peaches, cornstarch, butter, and 1/4 cup sugar in a bowl until combined. Divide the dough in half and roll out the first piece into an 11″ diameter circle. Place the dough into a 9″ pie pan and cut off any extra. 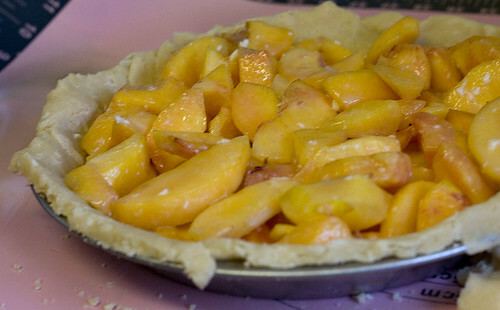 Spread the peach mixture into the pie crust. Roll out the second dough half into a circle 11″ in diameter. 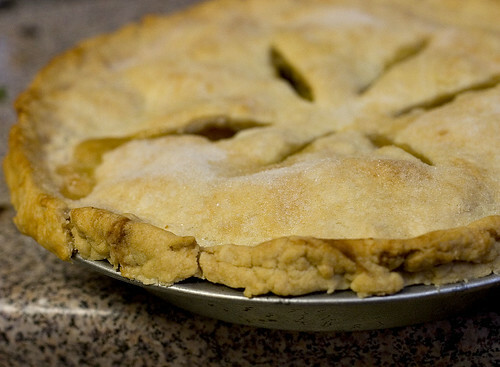 Place the dough on top of the pie, crimping the edges, and cutting off any extra. Make 6 cuts on top of the pie crust to allow venting. Sprinkle the remaining sugar over top of the pie crust. Bake in the oven for 10 minutes, then reduce the heat to 350ºF, and bake for 50 more minutes. Serve either warm or cooled. Place all ingredients in a food processor. Pulse until the mixture has the consistency of cornmeal. Add 3 to 4 tbsp of water and pulse until the mixture forms a ball. Knead the dough briefly so that the dough comes together. Wrap in plastic wrap and refrigerate until ready to use, at least 15 minutes.